With more than 600 million pictures taken at Walt Disney World Resort every year, it seems as though guests to the Vacation Kingdom enjoy capturing the memory of their vacations as much as they enjoy experiencing them. Disney's PhotoPass, which debuted in all four Walt Disney World theme parks on Dec. 1, 2004, presents guests with an alternative way to capture treasured moments. Using professional digital SLR equipment, photographers take photos of guests throughout the theme parks. Instead of receiving a paper claim ticket, guests receive a Disney PhotoPass that links all of their vacation photos together into one online account for easy online viewing and sharing. Guests can use one PhotoPass for their entire vacation or get a new PhotoPass each time they take a photo. Then, instead of having to wait in line at a Photo Center for their photos, guests will be able to view, share and order their photos online at DisneyPhotoPass.com. Although Disney's PhotoPass replaces the existing photo system at Walt Disney World Resort, guests will still be able to view and buy their vacation photos at Disney Photo Centers located throughout property. "We are always looking for ways to make our guest experience easier and more hassle-free," said Michael Colglazer, vice president, Disney Photo Imaging. "Disney's PhotoPass is a way of doing that. We think that Disney's PhotoPass will do for photography what Disney's FASTPASS has done for wait times at attractions -- drastically reduce or, in some cases, eliminate the lines while making the overall vacation experience more enjoyable." At DisneyPhotoPass.com, guests can also add decorative borders and other Disney-themed elements to their pictures. 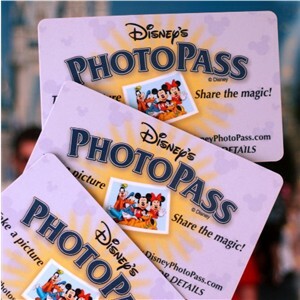 There is no charge for obtaining a PhotoPass or viewing or sharing your photos online. The cost of ordering prints from DisneyPhotoPass.com will be similar to the cost of buying the same photo at a Disney Photo Center.